When returning from a long day of work, it’s hard enough mustering the energy to make a cup of refreshing tea. Imagine then having to continuously stir said cup of tea. One could possibly pass out from the strain. Luckily those clever chaps at Bluw have devised a way to avoid this exertion. Introducing the Self Stirring Mug. No prizes for guessing what this little gem does. Press the button on the handle of the Self Stirring Mug to activate the tiny motor inside the bottom. Then watch as the propeller spins the contents, keeping your beverage lip-smackingly tasty to the last drop. Spiffing.Self Stirring Mug for those who are just plain lazy! Simply press the stir button and hey presto the perfect drink every time. Get maximum results with minimum effort! 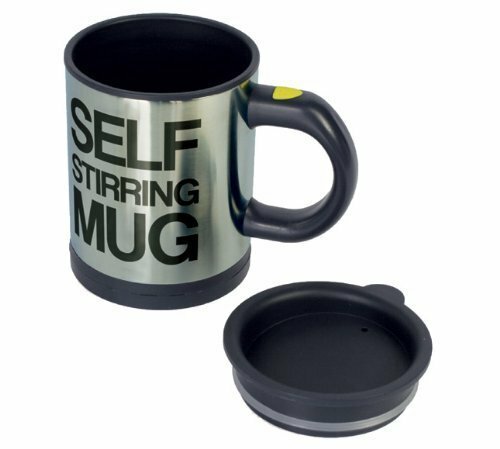 The self-stirring lazy mug is the ultimate lazy man’s mug.